Ruth Irene Skelton, age 94, of El Dorado Springs, MO, passed away on July 16, 2011, in Springfield, MO, at Christian Healthcare Nursing Home. She was born on July 6, 1917, to Robert and Ora Mae Wallis at Big Rock, Illinois. Ruth grew up and attended school in Sandwich, Illinois. After graduating from high school, she worked in various places including Chicago, IL, where she worked as a clerk. While in Chicago, she met and later married Vernon Skelton, Sr. who was training for service in the United States Army Air Corp. They married in West Palm Beach, Florida, on August 20, 1942. Vernon and Ruth celebrated 50 years of marriage before Vernon’s death in 1991. Five children were born to their union: Vernon, Jr. of San Francisco, CA; Robert of Independence, MO; Roger of El Dorado Springs, MO; Linda Donnelson of Battlefield, MO; and David of Warrensburg, MO. One granddaughter, Ester Pedrino, was raised by Ruth and Vernon from infancy. They lived in the Fort Myers, Florida area for many years until moving to El Dorado Springs, MO. In addition to raising her own children, Ruth cared for several other children as a child care provider. 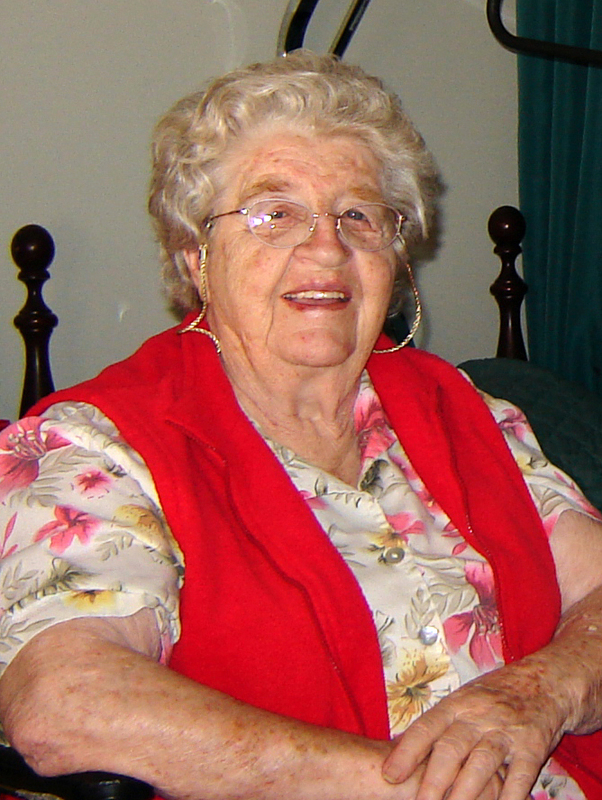 Ruth loved gardening, caring for animals, cooking, and being active in church. She was a kind-hearted person always willing to help others. Ruth and Vernon were faithful servants of the Lord and helped build up a church in North Fort Myers, Florida. Ruth was preceded in death by her husband, Vernon Skelton; her parents; four brothers: Robert, Dewey, Merle, and Ivan; and one grandson, Travis Skelton of Independence, MO. She is survived by one brother, Ralph of Sandwich, Illinois; her five children; eight grandchildren; two step-grandsons; and fourteen great-grandchildren. Services for Ruth Skelton will be held on Wednesday, July 20, 2011, at 11:00 a.m. at Bland-Hackleman Funeral Home. The family will receive friends prior to the service from 10-11 a.m. John Brooks will officiate and interment will follow in Coal Hill Cemetery under the direction of Bland-Hackleman Funeral Home. Pallbearers are Nathan Donnelson, Curtis Donnelson, Jace Donnelson, Tim Evert, Daniel Skelton and Matthew Skelton.